An MX (mail exchange) record is an entry in your DNSDomain Name System - Enables the translation of hostnames to IP addresses and provides other domain related information. zone file which specifies a mail server to handle a domain's email. You must configure an MX recordMail Exchanger record is a record in DNS that specifies which server is handles email messages. to receive email to your domain. 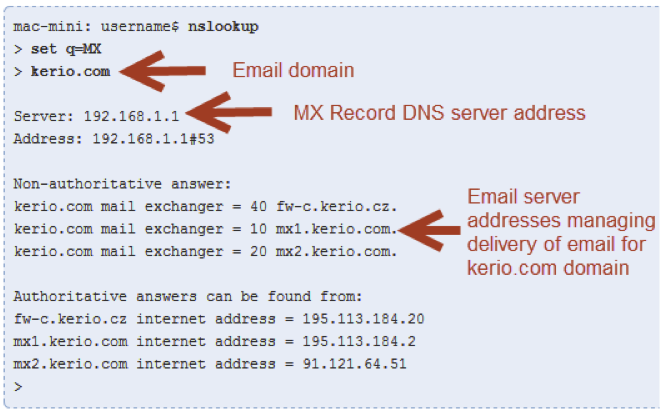 If you are using Kerio Connect as an internal email system, with no communication outside of your domain, it's not necessary to configure an MX record for your domain. You may configure any domain in Kerio Connect, as it does not perform any DNS validation of its local domain names. To relay email outside of your locally configured domains, ensure that the underlying operating system properly resolves domain names. This means that a valid domain name server must be configured in the TCPTransmission Control Protocol - ensures packet transmission./IP settings of the host operating system. In most cases, the authoritative name server is the DNS servers managed by your domain registrar – for example, Godaddy or Network Solutions. These domain registrars usually provide additional services, including DNS hosting. In this case, you will use a web-based DNS configuration utility to configure your MX record. Since most DNS servers store its information in a cache for a certain period of time, it might take up to 24 hours for the change to get propagated over the internet to DNS servers where the record is stored. Email delivery can be pointed to the secondary email server in the MX record list until the primary server DNS name is changed. You can check a DNS MX record using an online test tool (e.g. http://mxtoolbox.com/) or by using nslookup command-line tool. http://en.wikipedia.org/wiki/Mx_record - A mail exchanger record (MX record) is a type of resource record in the Domain Name System that specifies a mail server responsible for accepting email messages on behalf of a recipient's domain, and a preference value used to prioritize mail delivery if multiple mail servers are available. The set of MX records of a domain name specifies how email should be routed with the Simple Mail Transfer Protocol. http://www.icann.org/registrar-reports/accredited-list.html - The following companies have been accredited by ICANN to act as registrars in one or more top level domains. http://www.internic.net/regist.html - The following companies have been accredited by ICANN to act as registrars in one or more top level domains.